In 2015, James joined Strokes’ coaching staff as the assistant coach for the Club program and is now excited about his first season coaching the Competitive program. As the Head Coach at Wakefield High School in 2014, the crew finished 7th in the state in the Girls V4+, and 16th in the country at the SRAA National Regatta. Previously, James was the Head Coach at Holton-Arms, where the lightweight 4+ finished 2nd at the Conference Championships. In 2008 and 2009, he was the Varsity Women’s coach at Langley High School. James learned to row at Iona College, where he found success with a 3rd place finish in the JV 4+ at MAAC Championships, MAAC All-Academic Team and 1st in V8+ at Spring Metropolitan Championships. After graduating, James moved to Washington D.C. in 2007, and rowed for Capital Rowing Club’s Competitive Team in 2008. James is constantly impressed with the level of commitment and dedication the athletes of DC Strokes' competitive team have. He grew up playing hockey, and football for coaches that typically have a gruff demeanor. When he started coaching, he sought to emulate this coaching style, however, coaching women's rowing at the high school level he learned to balance being softer while still motivating crews. He’s found this balanced coaching philosophy has paid numerous dividends. Katie is a graduate of CRI’s Institute for Rowing Leadership and is currently the assistant women’s rowing coach at George Mason University. She has worked with high schools, colleges, and masters programs in MA and Seattle, including an internship coaching position with U of Washington coaching the walk-on women's team. As a student athlete at Ithaca College, Katie was a walk-on rower who became an all-American and team captain. Lis learned to row during her freshman year at Smith College in 1988, and continued to row throughout her four years at Smith, including three with the varsity squad. She has been a member of DC Strokes since 1993 but she has also rowed and competed with Alexandria Community Rowing, Potomac Boat Club, and the Thompson Boat Center. Her collegiate racing experience at Smith – including the Eastern Sprints – has been followed by more than 20 years of racing at the masters level at local, regional, and national regattas such as Masters Nationals and the Head of the Charles. 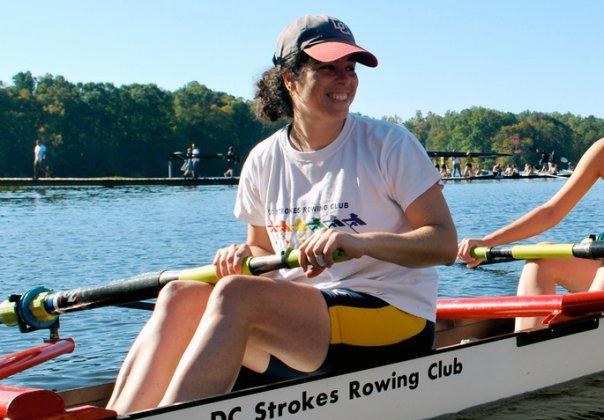 After graduating from Smith in 1992, Lis moved to Washington, D.C., and began coaching for DC Strokes in 2004, after the club relocated to the Anacostia Community Boathouse from it’s previous location at Thompson Boat Center. Elisabeth holds a Level II coaching certification from USRowing. DC Strokes's Learn to Row and Novice Program attracts the greatest diversity of people in terms of age (22-60), gender, sexual orientation (gay and straight), etc. but most if not all program members share the common desires of finding a new way to be healthier and more active as well as meet new people and make new friends. For many, it's their first time participating in an organized sport. Elisabeth's professional career has always been oriented in the environment, particularly in making sure there are places set aside for nature-based enjoyment and recreation. She finds that being a being a coach for people who are new to rowing dovetails nicely with this as rowing is an outdoor, water-based sport, allowing her to remind people of why it's important to appreciate and value the rivers and other bodies of water we row on. Her view is that rowing is not just about fitness and competition, but also about enjoying the unique features of where and when it takes place. Some of her strongest memories of rowing are tied together with things like flat mirror-like water, amazing sunrises and sunsets, beautiful scenery and wildlife, and the like. As a result, rowing's benefits can extend beyond the physical and should not be overlooked when thinking about getting into the sport.